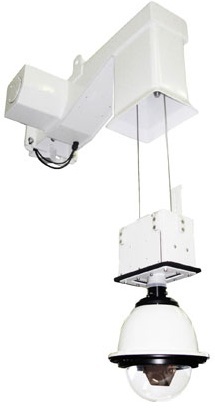 Servicing cameras mounted high in the air can be very problematic and costly. Renting a lift, transporting it to the site, and manoeuvring it in tight spots drives service expense, yet not maintaining them leads to early failure and poor performance. In this note, we examine a product from Videolarm/Moog named CamEvator that claims to solve the problem of accessing cameras for service in these hard-to-reach or disruption sensitive locations. Mounts on Poles or Walls: Self-contained unit requires no special pole and bracket mount flush to walls. Rigid Locking Mechanism: Limits camera movement at fully raised height. Mechanical Keyswitch Operation: Switch can be located up to 170' away for operator safety. In areas where accessibility is limited - like transportation or roadway pole cameras, CamEvator allows cameras to be routinely maintained without additional equipment or special considerations. Considering a worklift's large size and space required for stabilizing outriggers, running lifts on narrow easements like roadway shoulders may require interrupting traffic. The CamEvator allows high mounted cameras to be serviced from ground level, without subjecting workers to fatigue or falling risk. In addition, the unit has an option to remotely locate the main operation switch away from vulnernable areas directly beneath the camera. The mounting surface must be adequate to support the unit's substantial weight. This may restrict potential camera mounting locations to certain walls or poles, or those locations may require additional reinforcement before they can be used. However, the CamEvator unit is designed to be mechanically fastened or banded to a mounting surface, and no welding or special fabrication is necessary for most applications. Wind-induced swaying can be a significant source of false alarms in video analytic applications. To address this, the CamEvator is designed with a mechanically locking 'home' position beside only suspending the camera from cables. The manufacturer claims that despite widespread use in transportation applications with vehicle counting analytics, "To date CamEvator has not hindered analytic accuracy" and provides a stable mounting platform. While the overall rigidity of the mounting surface cannot be assured, Videolarm/Moog has designed CamEvator to not introduce instability into the video picture. CamEvator is available with integrated surge suppression for connection to unfiltered 'dirty' utility power. The unit supplies 120VAC 'convenience power' for the camera and any heater/blower assembly, but will likely require additional power transformers to be useable. The CamEvator housing includes space within the traveling head for this additional equipment. Although CamEvator claims to 'require no regular upkeep' of the unit, several access panels are designed into the main body for maintenance. Despite these claims, every outdoors-mounted mechanical device should anticipate service at some point, and major mechanical components can be reached from these panels. With a significantly higher price that standard fixed camera mounts, CamEvator is best justified where traditional methods of maintenance are high such as in situations where using work lifts or bucket truck based are too distruptive or costly, including servicing lone pole mounts, rough terrain/hard to reach cameras, or those adjacent to roadways. Scenario #1 Lone Camera: If a location has only one 'lone' inaccessible camera, a CamEvator unit could eliminate the need to rent a lift to service that single unit. It might take more a dozen or more service trips to justify the price premium of the CamEvator given the costs of boom lifts (often $500 - $1000 per day). However, presuming quarterly service to clean the dome and to maintain the gasketing, the mount may pay for itself over the course of 4 or 5 years. Scenario #2 Congestion: There may also be situations more difficult to quantify, where the camera needs to be mounted out of the reach of work lifts or where positioning a lift cost more than simple rental fees reflect. Consider cameras mounted on bridges or narrow roadways: in addition to eliminating the cost of positioning a lift, application of the CamEvator may reduce the 'cost' of congested traffic and the extra manpower required to supervise dangerous work. Assuming a road lane closure or 'traffic' interruption can cost between $700 and $2000, the acquisition cost of the CamEvator may be offset after a single maintenance event. Overall, though, the overwhelming majority of cameras that are easily accessible without much interruption (e.g., parking lots, non busy roadways) will likely find it less expensive overall to rent or use a lift when needed for servicing.